The Milwaukee Brewers have removed utility infielder Elian Herrera from their 40-man roster. General Manager David Stearns said he still hopes to sign him to a minor league deal, but said the open roster spot is more valuable at the moment as he continues to make moves to rebuild the Brewers. Herrera hit .242 with 18 doubles, seven home runs and 33 runs batted in over a career-high 277 plate appearances in 2015. 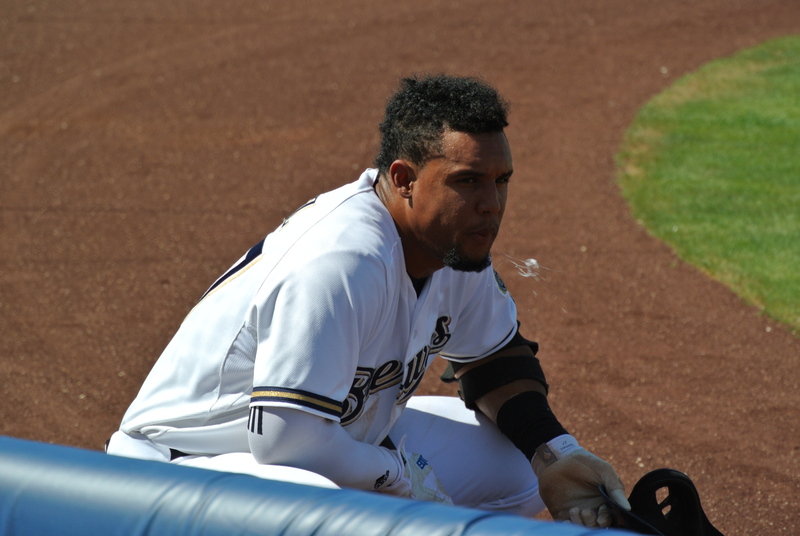 In 56 games with Colorado Springs, Herrera hit .357 with a .413 on-base percentage, 15 doubles, three homers and 27 rbi. The Brewers did offer contracts to three arbitration-eligible players, shortstop Jean Segura, right-hander Wily Peralta and left-hander Will Smith. The Milwaukee Brewers have been up and down offensively this season. On Friday night in our nations capitol, the Brewers were up, cruising to a 10-3 win over the Washington Nationals. The Brewers collected 14 hits, including eight off of Washington’s starter and loser Gio Gonzalez. Jonathan Lucroy, who has struggled offensively this season, had three hits for the Brewers in the win. 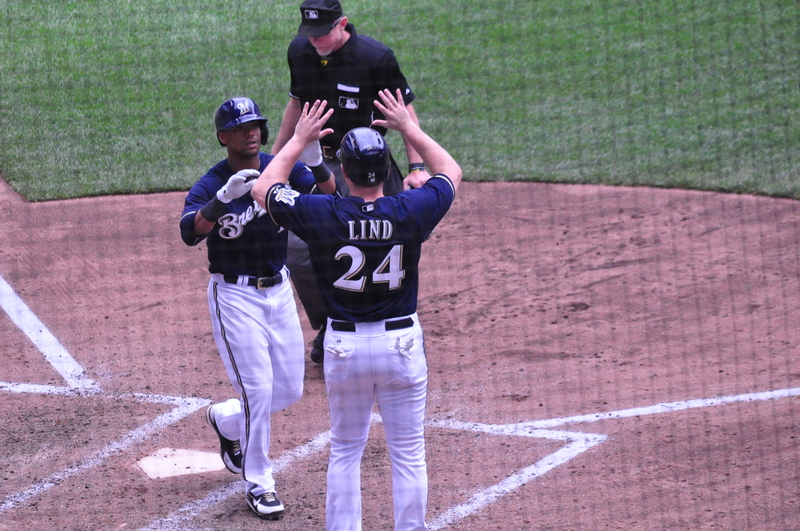 Adam Lind and Elian Herrera had two hits each and rookie Domingo Santana got his firs start as a Brewer after being recalled from the minors and delivered a two-run homer. Jimmy Nelson didn’t have his best stuff, but he covered 5 1/3 innings to earn his tenth win of the season. Nelson allowed two runs and five hits, including home run by Bryce Harper in the sixth. 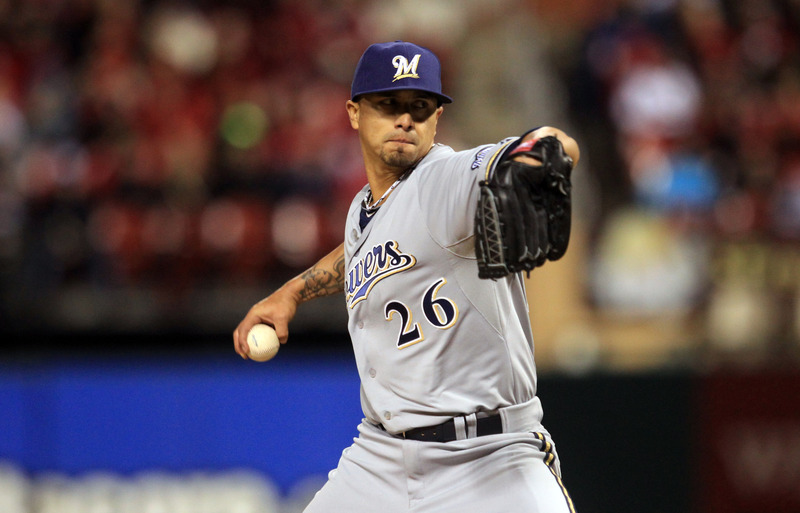 Kyle Lohse pitched the final three innings to earn his first career save. After the game last night, relief pitcher Neal Cotts was told he had been traded to the Minnesota Twins for a player-to-be-named or cash. For the second time in the last week, Khris Davis had homered twice in the same game. The Brewers outfielder now has three of his four multi-homer games this season. 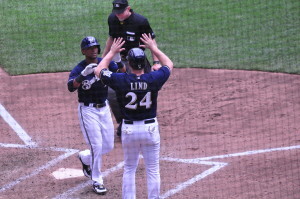 The Brewers hit three home runs in all, bring them from behind to beat the St. Louis Cardinals 5-4 at Miller Park. Sunday was the first time the Brewers even scored off of Cardinals pitching in the series. 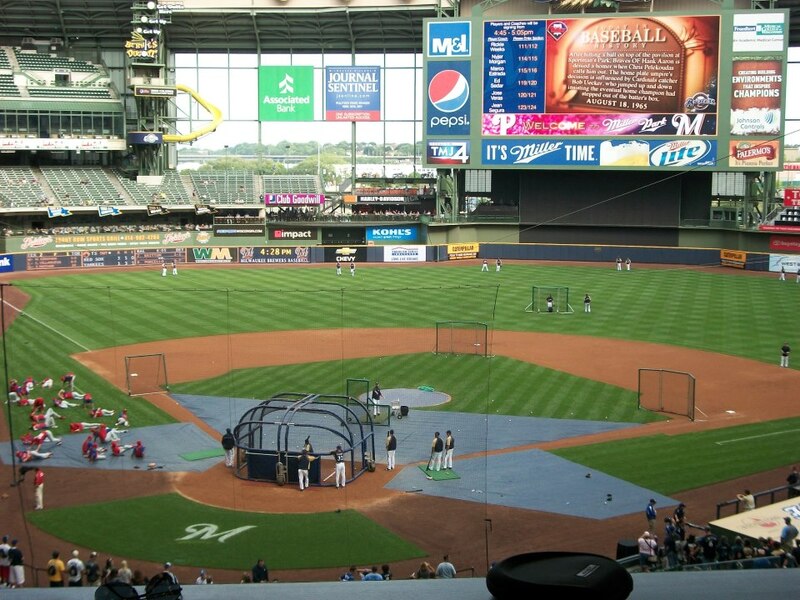 The Brewers return home to Miller Park today. Milwaukee Brewers manager Craig Counsell gave Ryan Braun and Aramis Ramirez the day off on Sunday and the rest of the team struggled offensively in a 2-1 loss to the Atlanta Braves in the series finale. Atlanta rookie right-hander Mike Foltynewicz held the Brewers to three-hits and a run in 7 2/3 innings. Foltynewicz struck out seven Brewers. The loss goes to Jimmy Nelson. He went 5 2/3 innings, allowed five hits and two runs with five walks and four strikeouts. The Braves took three of four in the series and the Brewers left Atlanta with a 4-6 record during their 10-game road trip. Foltynewicz started the day with a 5.32 ERA. Opponents were hitting .310 against him, but he turned things around against the Brewers. Milwaukee didn’t get to him until the 7th when Elian Herrera gave the Brewers their only run with a sacrifice fly to center. 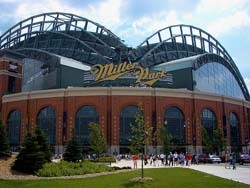 The Brewers return home today to open a series against the San Francisco Giants. Chicago left-hander Chris Sale held the Milwaukee Brewers to 3-hits while striking out 11 in eight innings as the White Sox pulled out a 4-2 win at Miller Park. Sale walked just one and improved to 3-1 on the season. He out-dueled Brewers starter Mike Fiers, who allowed just 2 runs on five hits with a walk and seven strikeouts in 6 1/3 innings of work. The game was tied 2-2 in the 8th when Brewers reliever Michael Blazek (3-1) entered the game. He retired the first batter he faced, before running into trouble. Alexei Ramirez ended up driving in the winning run with a bases loaded sacrifice fly. The Sox added an insurance run in the 9th for the games final run. Sale held the Brewers scoreless until the 5th when Elian Herrera homered for the third straight game. 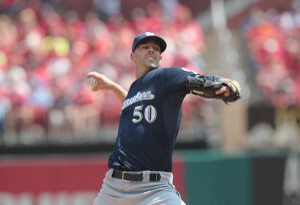 The Brewers fell to 12-22, 12-games behind the Central Division leading St. Louis Cardinals. The Brewers send Jimmy Nelson (1-3, 4.25) to the mound tonight in the final game of the series. Jose Quintana (1-3, 5.03) gets the nod for the White Sox. First pitch is set for 7:10 pm. The Milwaukee Brewers ran their win streak to three-games last night, knocking off the Chicago White Sox 10-7 at Miller Park. Elian Herrera clubbed a game-winning two-run home run in the 8th inning to break a 7-7 tie. Khris Davis followed with a solo shot to cap the scoring. Herrera also doubled and scored, getting another start at third base for the ailing Aramis Ramirez. The home run for Herrera is his second in as many games. The Milwaukee Brewers and Cincinnati Reds tied a major league record Tuesday at Miller Park, combining to hit three grand slams in one game. The one problem: the Reds hit two of them. Cincinnati (7-7) finished with five home runs in a 16-10 defeat of the Brewers (2-12), marking their seventh consecutive loss. Barring any late changes or injuries, the Milwaukee Brewers have their 25-players that they’ll open the season with on Monday against the Colorado Rockies at Miller Park. The Brewers haven’t announced their plan for relief pitcher Jim Henderson, but they’ll decide on one of two options. He’ll either open the season in the minors or on the disabled list. Francisco Rodriguez blew a 9th inning lead and the Milwaukee Brewers fell to the San Diego Padres 3-2 in 10-innings on Wednesday night at Petco Park. Padres catcher Rene Rivera’s home run tied the game, then Rivera delivered the game winning rbi single off of Zach Duke in the 10th to win it. The Brewers dropped 2 of 3 in the series and fell to 6-5 in extra-inning games this season. After Rodriguez gave up the 9th inning home run, Brewers manager Ron Roenicke was ejected for arguing balls and strikes with home plate umpire Mark Ripperger. Gallardo escaped a pair of jams in the fifth and sixth innings to keep the Padres off the scoreboard. He wound up pitching six innings of shutout, 3-hit ball. Gallardo went into the night needing five strikeouts to surpass Ben Sheets for the all-time franchise lead. But first the first time ever, Gallardo failed to strike out a single batter. 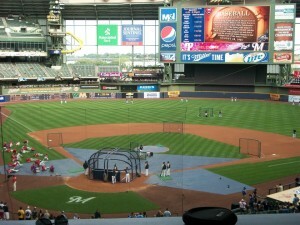 The Brewers scored twice in the 7th when Lyle Overbay singled. Elian Herrera followed with a double to right, scoring Overbay. Herrera took third on the throw, then scored on a wild pitch. The Brewers missed a chance to increase their NL Central Division lead on St. Louis. The Cardinals lost last night as well. The Brewers still hold a game and a half lead entering an off day today. They’ll open a 3-game weekend series in San Francisco against the Giants on Friday night.